Linda C. Wisniewski was recently interviewed by Dr. Sally Witt on BlogTalkRadio about writing and her memoir Off Kilter: A Woman's Journey to Peace with Scoliosis, Her Mother, & Her Polish Heritage. Listen to the interview online here. There are technical difficulties in the first part of the interview, but once those are addressed Wisniewski and Witt proceed into discussion of Wisniewski's background, how she came to write her memoir, her writing -- and publishing and marketing -- process, and what she's working on now. 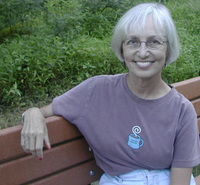 Becca Taylor talks with Linda C. Wisniewski, author of Off Kilter: A Woman's Journey to Peace with Scoliosis, Her Mother, & Her Polish Heritage (Pearlsong Press, April 2008) in the May 2008 edition of the Story Circle Network podcast. Linda shares her experience with writing as healing, and also provides tips on pursuing publication. You can also access the podcast recording directly by clicking here to listen or download. Pat Ballard, the Queen of Rubenesque Romances, guested on the Health At Every Size Radio show with Dr. Peggy Elam this morning. She spoke about her fall 2008 experiences with gallbladder surgery, and how people of size can help ensure they receive good medical care. WTVL Radio's Bob Cudmore blogged about Off Kilter author Linda C. Wisniewski today at the Schenectady Daily Gazette website. Cudmore reported the impending (April 2008) publication of Wisniewski's memoir about growing up in Amsterdam, NY, as well as a planned feature on her this weekend in the print edition of the Gazette. He also included a link to a recording of his radio interview of Wisniewski.